A developer has uncovered how Photos will employ facial and object recognition to generate Moments and yield search results in iOS 10 and macOS Sierra. After Apple released iOS 10 and macOS to developers at WWDC, a developer discovered the list of hardcoded objects, scenes, and facial expressions that the Photos app will be able to recognize. According to developer Kay Yin, Photos will be able to recognize seven types of facial expressions: greedy, disgusted, neutral, screaming, smiling, surprised, and suspicious. More impressively, the Photos app will also be able to detect 4,432 objects and scenes, from “alleyways” to “zucchinis.” This object and scene recognition is used by Photos to yield accurate search results in all languages. “We do 11 billion computations per photo to be able to detect things like, there’s a horse, there’s water, there’s a mountain, and with this you can do really powerful searching on your device,” Craig Federighi, Apple’s senior vp of software engineering, said during the WWDC keynote. Why this matters: Apple’s improved Photos app in iOS 10 is now a lot like Google Photos: using face, object, and scene recognition so you can search your camera roll by person, location, or topic. 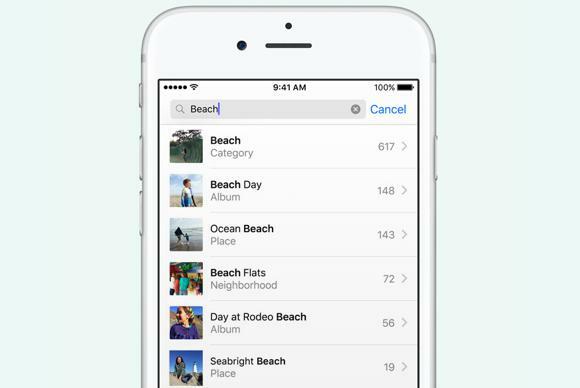 Unlike Google Photos, however, Apple has made sure that Photos uses only machine learning to analyze the photos that are stored locally on your iPhone. Apple believes there doesn’t necessarily have to be a trade-off between machine learning and privacy. At WWDC, the iPhone-maker introduced the concept of “differential privacy,” which employs crowdsourcing to make a more useful product, without exposing any one individual’s data. And Apple seems to be relying on this concept in the new Photos app, the place where we store our most personal information.